Lineout records act I am Immune will be performing live with their new drummer and new material! Tallulah Rendall to guest onstage with SonVer. SonVer's Jo Quail will be playing cello during Tallulah Rendall's set. Lucie Dehli [Elephant Leaf] to guest onstage with SonVer to debut tracks from the forthcoming '3 Songs' EP. All the profits from this Line Out Showcase gig will go as a donation to Southampton University's Centre for the Archaeology of Human Origins as a donation to help fund student research. At The Camden Underworld. 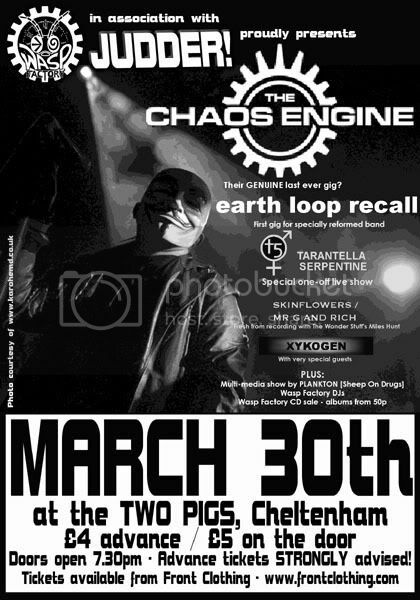 Email earthlooprecall@gmail.com for tickets. At the Purple Turtle in Camden. See http://www.myspace.com/iamimmune for more details. Earth Loop Recall play their next London live show on Thursday 13th September at Industry, Curtain Road, Shoreditch, EC2A 3JX. ELR will be onstage at 8.30pm. If you are intending to come to this gig [and I hope you do], then you can get yourself into the gig for £4, as opposed to the door price of £5. This gig will be the first with the latest line-up of ELR, which now features former Deathboy guitarist Jason Knight on bass. London, Islington Academy, Elektrofest 07 and single and video launch party. Trauma Pet will be holding their video and EP launch party at this event. Their GENUINE ACTUAL last gig ever...? Tickets such a bargain it'll make you CRY. The Queens Hall, Queens Road, Nuneaton. There will be a free bus to take people with tickets and that have reserved a place on the bus from outside The Gallows to the new venue and back again after the show. Please email me at robert.lee67@ntlworld.com to reserve your place on the bus. For people who do not want to make the trip to the new venue you can get a refund through Ticket web. Trauma Pet are playing Friday night at Whitby Goth weekend. At Slimelight, 7 Torrens Street, Islington, London. Including 3 floors Slimelight after show. Free entry to members and resurrection customers. At the Railway Inn, Winchester. Details: 10/12 Euro. Doors open 8pm. Details: 8pm - 4am entrance 10 euros. Details: Doors 7.30pm, cover £5 all to charity. Click here to visit the charity's website. Flag promotions presents 4 absolutely storming electro acts. Spooky Halloween Special from The Kooler at The White Horse, West Wycombe Road, Wycombe. Details: Doors open 8pm, DJs, entrance £5 or £4 with flyer. 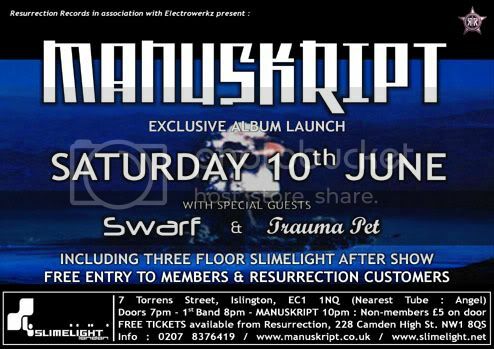 Trauma Pet's penultimate london gig of 2005 with Blue October and Rapid Fiction. At Madame Jojo's, Brewer Street, Soho.